Wyville Rutherford’s ‘conspicuous gallantry’ during the Battle of Messines won him a Military Cross. But the medal, like Wyville, didn’t make it back to New Zealand. History curator Kirstie Ross shares details of Wyvillle’s WWI experiences and a unique group of mementos that survived him instead. Wyville Rutherfurd (sometimes spelled Rutherford) was awarded a Military Cross because of his actions during the pivotal Battle of Messines (Flanders) and as well as his deeds a week later. 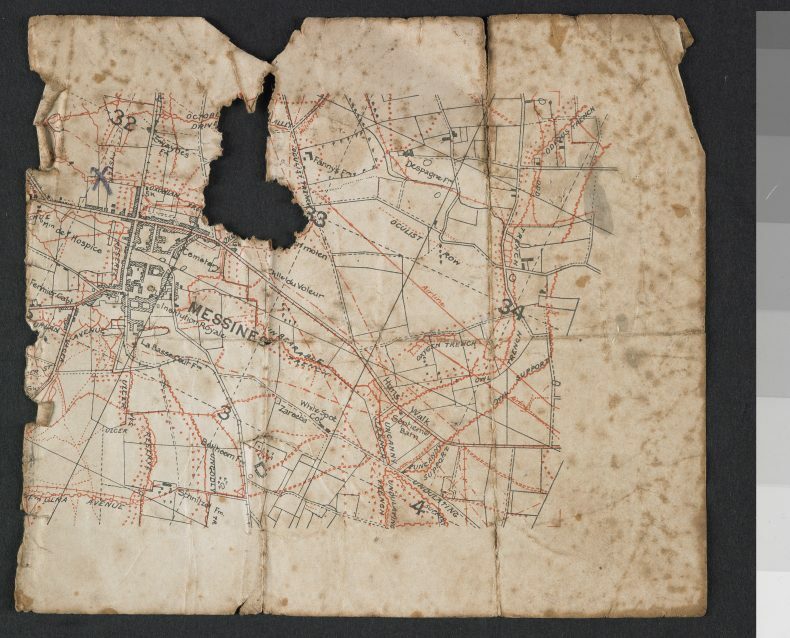 Messines had been captured, back in October 1914, by the German Army. The Woodville Examiner described the successful recovery of this part of the Western Front as ‘removing a kink in the line’. 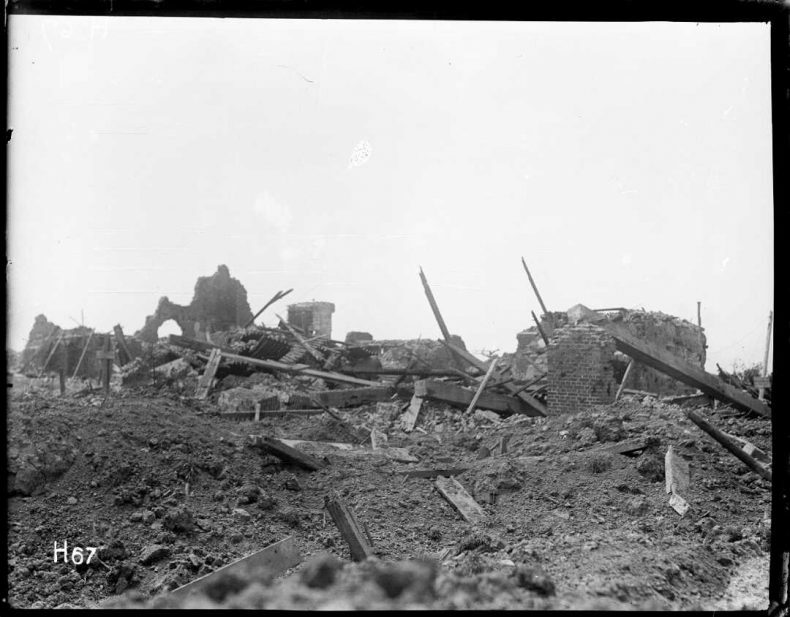 Harry Sanders, the New Zealand Division’s newly appointed official photographer, recorded the battle with his camera (see above). A Wellington College old boy and mining engineer, Wyville left with the Main Body of the NZEF in October 1914. He fought on Gallipoli where he was wounded during the Battle of Chunuk Bair. After his recovery and further training, he moved over to the Western Front with the New Zealand Division. In January, Wyville personally received his medal from King George V, before heading off on a top secret mission in Persia (Iran) with the ‘Dunsterforce’ (also known as the ‘Hush-Hush Brigade’). Wyville’s engagement to his sweetheart, Dorothy Broad, was announced around the time he left with this elite group of soldiers selected from the British Empire’s armies. Many of the men in Dunsterforce were ‘decorated’ with medals. 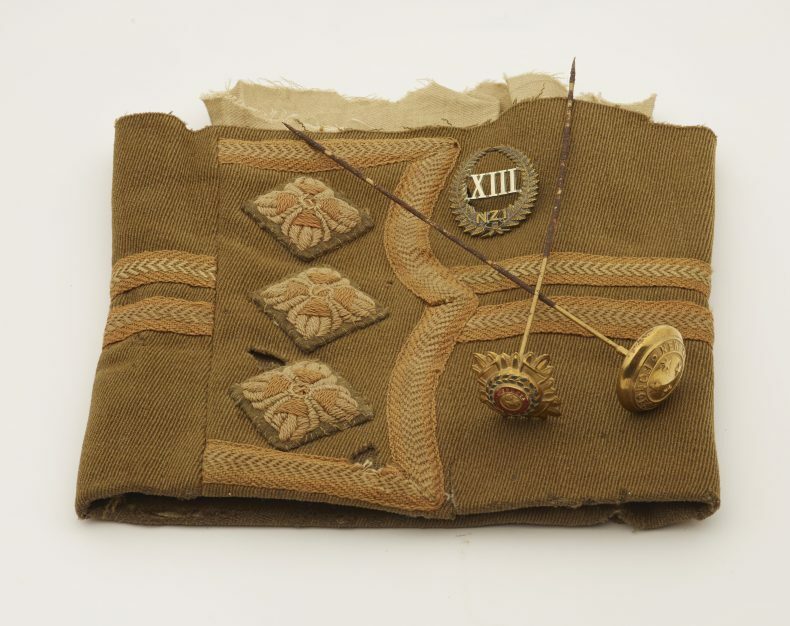 However, their ‘decorations’ were worn only on formal occasions; instead a coloured ribbon or stripe which matched the medal was sewn onto a tunic as a substitute. Here’s the stripe for Wyville’s Military Cross (white, purple, white). 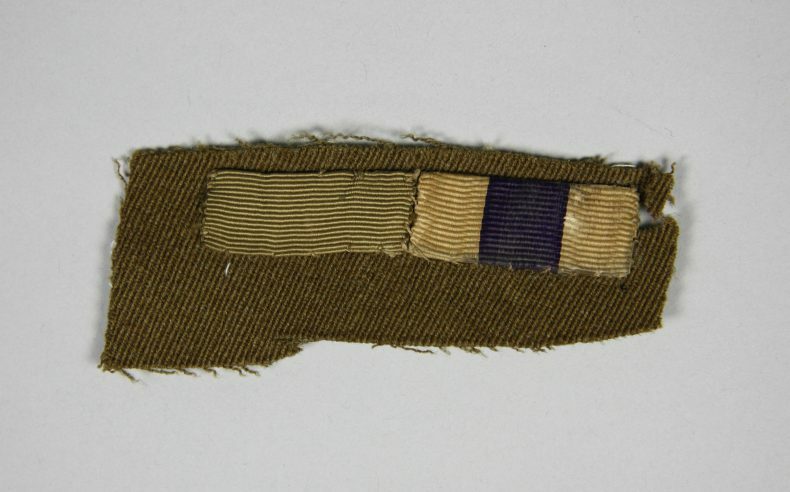 It’s on a remnant of his uniform which, unlike Wyville and his Military Cross, managed to return to New Zealand. Because, while he was overseeing engineering works in the city of Kasin (Qasvin) Wyville was struck down, first by malaria and then by pneumonia as a complication of influenza. He died on 19 October 1918, 23 days before the Armistice. Wyville’s recently widowed mother tried to recover her son’s medal from the Defence Department. It was not forthcoming – the Department did not know where it was. Even if it had been found, his fiancé Dorothy would not have received it, for she was not Wyville’s next-of-kin. 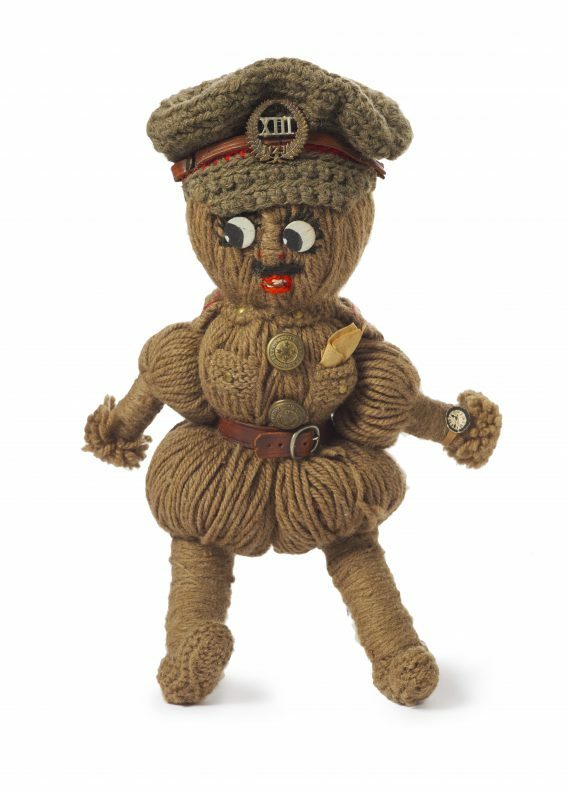 She had to console herself with the woollen version of Wyville she’d made when he left, and an ever-diminishing group of fragments from his uniform (see some below). Instead Dorothy probably declared her personal and sentimental connection to the war by wearing hatpins she made with buttons from Wyville’s uniform. They were patriotic accessories that doubled as very personal mourning jewellery. Wyville’s Military Cross has not, as far as I know, ever surfaced. Its whereabouts remains a mystery, 100 years since Wyville won it. Colonist, 9 June 1917, p. 5. Feilding Star, 9 June 1917, p. 2. Woodville Examiner, 8 June 1917, p. 2. See also: Kate Hunter and Kirstie Ross, Holding on to Home: New Zealand Stories and Objects of the First World War, Te Papa Press, 2014, pp. 216-7. Hi Kirstie, have just caught up with your blog on Wyville. Good one! You may be interested to know that Wyville had a first cousin, Captain Edwin James Rutherfurd, who served as a doctor in the British Medical Corps from Gallipoli through WW1, and was also awarded the Military Cross. Interesting that two closely-related lads from opposite sides of the globe should have been there together. Wonder if they ever met? Edwin was my great uncle. am now in touch with another RUTHERFURD member of the family have got her up to date with the medal etc… one way or other we hope to trace the missing medal! have heard back from RUTHERFURD/RUTHERFORD folk so now forwarded the Blog to them, as one said didn’t know about the Medal Adele! have also emailed Gareth in Masterton about it… it will all help to locate a medal I hope.. Can the historian get back to me off line please.. am off to Featherston Messines Service this 1pm today.. don’t ring the phone is out of order! thanks.. Thanks very much for your replies, and your interest, mobilising all of your contacts. Great that you have shared the blog. In 2015, Patricia Rutherford and her husband visited Te Papa, and I showed them the ‘Dorothy and Wyville’ collection. Patricia kindly provided me with some family history as well. What’s interesting is that the items came to Te Papa via Dorothy Broad’s great niece. I will be in touch offline via email about Wyville’s Military medal and getting to the bottom of the mystery of its whereabouts. Can Kirstie please email me off site??? I have had replies from family and forwarded the Blog to them, so many hands make light work.. also added Gareth in Masterton this am.. I also belong to the Wellington Promotion Heritage Council! under Clareville Taphophile..
brother to Herbert Spencer Rutherford of Masterton, I will get in touch with the families for you and hope for some good results! just checked on line the family tree, knew I was correct! Clareville Researcher! if its the family I know off it was originally RUTHERFURD until one married a RUTHERFORD… will check it out, as in touch with family on both U and O!!! some were in early Carterton, then Bideford way out of Masterton, one soldier is on a stained glass window at St Matthews Masterton! latest have emailed several of the family now await their response! done both spellings as two different family but connected by marriage!